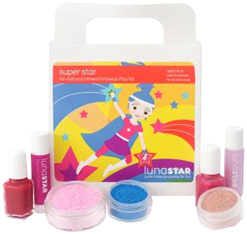 Luna Star Play Makeup Kit, Green Sprouts Baby Toys! • Play Makeup Kit Ballet Star: For girls who love to dance! Ages 3 and up. Safe and nontoxic. For all skin tones. All contents are for external use only. Use the recyclable carry sac for the makeup or other treasures! 4 pc. ORDER TODAY! • Play Makeup Kit Pop Star: For girls who love to sing! Ages 3 and up. Safe and nontoxic. For all skin tones. All contents are for external use only. Use the recyclable carry sac for the makeup or other treasures! 4 pc. ORDER TODAY! • Play Makeup Kit Soccer Star: For girls who love sports! Ages 3 and up. Safe and nontoxic. For all skin tones. All contents are for external use only. Use the recyclable carry sac for the makeup or other treasures! 4 pc. ORDER TODAY! • Play Makeup Kit Princess Fairy: Every girl can be a princess! Ages 3 and up. Safe and nontoxic. For all skin tones. All contents are for external use only. Use the recyclable carry sac for the makeup or other treasures! 4 pc. ORDER TODAY! • Play Makeup Kit Sparkle Fairy: Every girl can sparkle! Ages 3 and up. Safe and nontoxic. For all skin tones. All contents are for external use only. Use the recyclable carry sac for the makeup or other treasures! 4 pc. ORDER TODAY! • Play Makeup Kit Fancy Fairy: Every girl can be magical! Ages 3 and up. Safe and nontoxic. For all skin tones. All contents are for external use only. Use the recyclable carry sac for the makeup or other treasures! 4 pc. ORDER TODAY! • Play Makeup Kit Deluxe Super Star: Every girl is a star! Ages 3 and up. Safe and nontoxic. For all skin tones. All contents are for external use only. Use the recyclable carry sac for the makeup or other treasures! 7 pc. ORDER TODAY! • Play Makeup Kit Deluxe Queen Fairy: Every girl can be a fairy queen! Ages 3 and up. Safe and nontoxic. For all skin tones. All contents are for external use only. Use the recyclable carry sac for the makeup or other treasures! 7 pc. ORDER TODAY! Play Makeup Kit Ballet Star 4 pc. Play Makeup Kit Pop Star 4 pc. 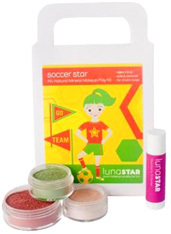 Play Makeup Kit Soccer Star 4 pc. Play Makeup Kit Princess Fairy 4 pc. Play Makeup Kit Sparkle Fairy 4 pc. 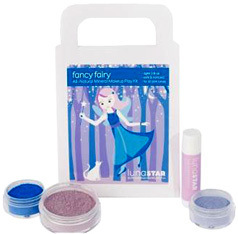 Play Makeup Kit Fancy Fairy 4 pc. Play Makeup Kit Super Star 7 pc. 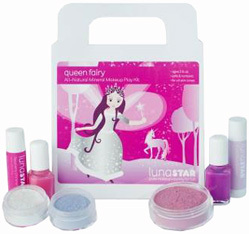 Play Makeup Kit Queen Fairy 7 pc. SETS & KITS: Play Makeup Kit, Standard 4 pc. SETS & KITS: Play Makeup Kit, Deluxe 7 pc. -- Maui Surf Eyeshadow, 1 g.
-- Pacific Sparkles Eyeshadow, 1 g.
-- Palm Springs Sun Blush, 3 g.
-- Strawberry Shortcake Lip Shimmer, 2.55 g.
-- Rockies Dawn Eyeshadow, 1 g.
-- Canyon Ascent Eyeshadow, 1 g.
-- Strawberry Shortcake Lip Shimmer, 2.25 g.
-- Mesa Verde Eyeshadow, 1 g.
-- Acadia Breeze Eyeshadow, 1 g.
-- Del Ray Reflection Blush, 3g. -- Silver Sparkles Body Shimmer, 3 g.
-- Strawberry Shortcake organic Llip Shimmer, 2.55 g.
-- Rich Pink Lemonade organic Lip Shimmer, 2.55 g.
-- Hartford Nail Polish, 5 ml. -- Yellowstone Trail Eyeshadow, 1g. -- Lake Michigan Dip Eyeshadow, 1g. -- South Beach Dawn Blush, 3g. -- Silver Sparkles body shimmer, 3g. -- Raspberry Strudel organic Lip Shimmer, 2.55 g.
-- Coral Coconut organic Lip Shimmer, 2.55 g.
-- Denver water-based Nail Polish, 5 ml. Natural Makeup Kit Shining Through 4 pc. Natural Makeup Makeup Kit Glorious Afternoon 4 pc. Natural Makeup Kit Up and Away 7 pc. Natural Makeup Makeup Kit Far and Wide 7 pc. SETS & KITS: Natural Makeup Kit, 4 pc. SETS & KITS: Natural Makeup Kit, 7 pc. • Natural Play Makeup Kit Ballet Dancer: You'd love to play dress up with your own safe and natural make-up kit. Hours of play and fun with the non-toxic products that you will feel good about. Loved by girls of all ages. 5 pc. ORDER TODAY! -- 1 Sheet of Nail Decals. -- Golden Sunlight: Bright fire Red with golden glitters. Excellent coverage. -- Ballerina Beauty: A soft shimmer Pink to go with your ballet outfit and shoes. You can create many nail art patterns along with the Golden Sunlight red nail polish. • Natural Play Makeup Kit Little Princess: You'd love to play dress up with your own safe and natural make-up kit. Hours of play and fun with the non-toxic products that you will feel good about. Loved by girls of all ages. 5 pc. ORDER TODAY! -- Twinkled Purple: Purple with multi colored large glitters. An exclusive "liquid sand" formula. -- Apple Blossom: A hot shimmery Pink. • Natural Play Makeup Kit Party Time: You'd love to play dress up with your own safe and natural make-up kit. Hours of play and fun with the non-toxic products that you will feel good about. Loved by girls of all ages. 5 pc. ORDER TODAY! -- Rock Star: A neon Orange sheer finish with very bright green and gold sparkles. • Natural Nail Salon Kit Forever Sparkle: Nail Salon Kit is perfect for a " nail salon day" or birthday gift. These award winning, odorless natural nail polishes, along with the cute nail decals, deliver fun, nail beauty and safety that children and parents can feel good about. 4 pc. ORDER TODAY! -- Twinkled Purple: Purple with multi colored large glitters. An exclusive unique "liquid sand" formula. • Natural Nail Salon Kit Little Valentine: Nail Salon Kit is perfect for a " nail salon day" or birthday gift. These award winning, odorless natural nail polishes, along with the cute nail decals, deliver fun, nail beauty and safety that children and parents can feel good about. 4 pc. ORDER TODAY! -- Rock Star: Neon Orange with sparkles. A sheer finish with very bright green and gold glitters. • Natural Nail Salon Kit Little Mermaid: Nail Salon Kit is perfect for a " nail salon day" or birthday gift. These award winning, odorless natural nail polishes, along with the cute nail decals, deliver fun, nail beauty and safety that children and parents can feel good about. 4 pc. ORDER TODAY! -- Mermaid Blue: Deep Blue with Lime green shimmers. A cute "peacock-blue" finish. -- Princess Dress: A rich Purple shimmery colour. Excellent coverage. Play Makeup Kit Ballet Dancer 5 pc. Play Makeup Kit Little Princess 5 pc. Play Makeup Kit Party Time 5 pc. Nail Salon Kit Forever sparkle 4 pc. Nail Salon Kit Little Valentine 4 pc. Nail Salon Kit Little Mermaid 4 pc. SETS & KITS: Natural Play Makeup Kit, 5 pc. SETS & KITS: Natural Nail Salon Kit, 4 pc. • French Manicure Kit: Water-based French Manicure Kit with a natural looking pearly white color for nail tips and a soft see through pink to finish the manicure. Nail guides/taps are included. Suncoat nail polish is non-toxic and earth friendly. Water Based Nail Polish, 0.5 oz. / Suncoat Clear Top Coat, 0.5 oz. ORDER TODAY! Ingredients: Aqua (water) (65+%), acrylate copolymer (25+%), styrene-acrylate copolymer, Glycol ether, dibenzoate ester. May contain [+/- mica], [+/- iron oxide], [+/- titanium dioxide]. SETS & KITS: French Manicure Kit, 2 pc. Natural and classic, the Wooden Rattles help promote motor development and the shape is easy for your baby to grasp and shake. Made from FSC certified, natural wood with water-based stains, the Wooden Rattles is safe for your baby. • Natural Wood Rattle Car: The Car Rattle sets your baby behind the wheel! The car shape rolls easily on surfaces while wooden rings spin and rattle. Measures 7 x 4 x 3 inches. Recommended for ages 6 months+. BUY NOW! • Natural Wood Rattle Tree: The Tree Rattle places nature in your baby's hands. The fruit tree shape is easy for your baby to grasp and shake. Measures 7 X 4 X 2 inches. Recommended for ages 6 months+. BUY NOW! • Natural Wood Rattle Flower: The Flower Rattle has a fun bouquet flower shape that is easy for your baby to grasp and shake. Measures 7 X 4 X 2 inches. Recommended for ages 3 months+. BUY NOW! Organic Animal Rattles are your baby's new best friend. Made from crocheted, organic cotton, these organic animal rattle toys have an exclusive texture to excite your baby's senses during cuddling and teething. Animals are easy to hold and shake, keeping your baby entertained and help develop fine motor skills. • Organic Animal Rattle Aqua Bear: Measures 9 x 4 x 1 inches. Recommended for ages 3 months+. BUY NOW! • Organic Animal Rattle Green Fox: Measures 9 x 4 x 1 inches. Recommended for ages 3 months+. BUY NOW! • Organic Animal Rattle Pink Bunny: Measures 9 x 4 x 1 inches. Recommended for ages 3 months+. BUY NOW! • Organic Chime Rattle: Organic Chime Rattle lays a crocheted cotton twist on a classic multicolor rattle. Dumbbell shaped Chime Rattle is easy for your baby to grasp and shake. Made from crocheted, organic cotton, the chime rattle has a soft, exclusive texture to stimulate your baby's senses. Measures: 6 x 4 x 2 inches. Recommended for ages 3 months+. BUY NOW! 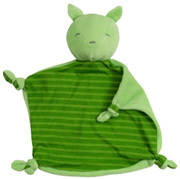 The Organic Blankie Animal is ultra-soft to the touch and helps stimulate sensory development. Knotted corners provides additional comfort for your teething baby. 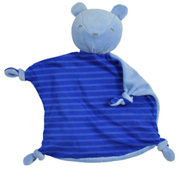 Animal Blankie characters boost interactive play between your baby and his/her favorite character. Made with organic cotton/poly Velour and organic cotton fill. • Organic Blankie Animal Green Fox: Measures 12 x 12 x 2½ inches. Recommended for ages 3 months+. BUY NOW! 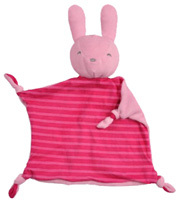 • Organic Blankie Animal Pink Bunny: Measures 12 x 12 x 2½ inches. Recommended for ages 3 months+. BUY NOW! • Organic Blankie Animal Royal Bear: Measures 12 x 12 x 2½ inches. Recommended for ages 3 months+. BUY NOW! 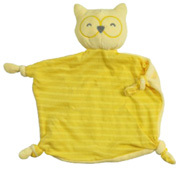 • Organic Blankie Animal Yellow Owl: Measures12 x 12 x 2½ inches. Recommended for ages 3 months+. BUY NOW! Foster creative, interactive play and stimulate creative development with the Organic Finger Puppets 3 Pack. Your child will love exploring story time with his favorite finger puppet friends. Made with organic Cotton Jersey and organic cotton fill. • Organic Finger Puppet Set Bunny Badger Bee: Includes finger puppet each of Badger, Bee and Bunny. Recommended for ages 3 months+. BUY NOW! • Organic Finger Puppet Set Fox Owl Frog: Includes finger puppet each of frog, fox and owl. Recommended for ages 3 months+. BUY NOW!